One Sunset. Lyons, Colorado. 16 Sept 2012. 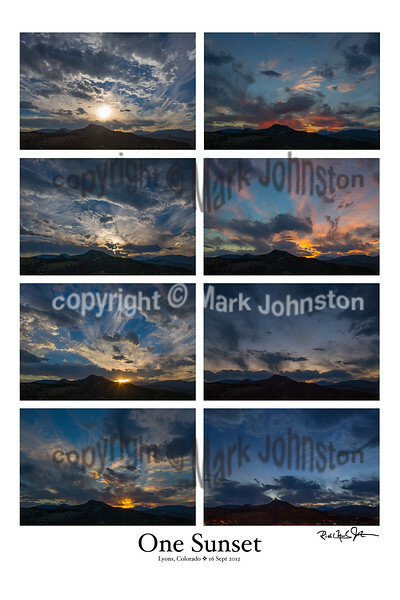 The octaptych is comprised of a series of photographs taken over the course of a single afternoon near the town of Lyons, Colorado. It features a remarkable variety of cloud types, a colorful sunset, and the iconic profiles of Mt. Meeker and Long's Peak [the highest summit in Rocky Mountain National Park] on the horizon. The image is 7200 x 10800 pixels, and prints at 24" x 36" at high resolution.